Generally speaking, excipients are the major components of most drug formulations. In the past, pharmaceutical excipients were viewed as inert ingredients, playing an insignificant role in the performance of formulations containing active pharmaceutical ingredients (APIs). This view has changed as pharmaceutical formulators have gained greater awareness of the importance of excipient purity and how it can contribute to the production of more stable drug formulations. 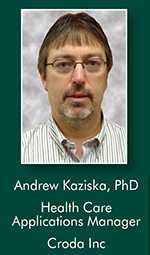 Drug Development & Delivery recently interviewed Dr. Andrew Kaziska, Health Care Applications Manager at Croda Inc, to discuss the company’s Super Refining technology and the benefits of excipient purity in drug formulations. Q: Can you provide some background information about Croda and what makes this company unique as an excipient supplier? A: Croda Inc, located in North America, is a wholly owned subsidiary of Croda International Plc, a UK-based manufacturer and worldwide supplier of oleochemicals. Croda offers one of the widest ranges of chemical specialties, surfactants, and high-purity lipids available to the pharmaceutical industry. Our products are manufactured at locations around the world, allowing us to provide consistent, continuous, and local sourcing. Croda’s niche in the pharmaceutical market is our Super RefiningTM technology that allows us to maximize the purity of an excipient through the removal of polar impurities that may negatively impact a drug formulation. The purification of our excipients through the Super Refining process does not impact the integrity of the excipient, nor does it chemically change the excipient in any way; thereby allowing maximum excipient performance. Q: What are the primary differences between a compendial excipient and a Croda high-purity excipient? A: The Super Refining process eliminates or reduces many of the impurities that are normally present in pharmaceutical pharmacopeia-grade excipients. The impurities that are reduced during the Super Refining process can be moisture, residual catalysts, peroxides, and/or aldehydes. Because these impurities can have a significant impact on the integrity of the drug and/or the final formulation, Croda applies tighter internal testing specifications as compared to what is specified in the USP/NF, PhEur, and/or JP/JPE monographs. We guarantee the purity of our Super Refined excipients by meeting these tighter internal specs. As an additional means of ensuring shelf stability, we also pack our Super Refined excipients under nitrogen. Q: How does purity of an excipient impact a drug formulation? A: As previously mentioned, the Super Refining process optimizes the purity profile of the excipient by removing or reducing the levels of polar impurities that are normally present in some pharmaceutical-grade excipients. The removal or reduction of these impurities helps maintain cellular homeostasis and reduce cellular irritation, and this contributes to increased patient comfort and compliance. In addition, it helps reduce API interaction in order to maintain both the stability of the drug and the finished formulation, which can ultimately impact the overall performance of the drug product. Q: In addition to stability benefits, what other benefits does Super Refining provide? A: Super Refined excipients have been tested to demonstrate improvements in multiple parameters that can lead to positive impacts on the final drug formulation. Because oxidative impurities have been shown to both accelerate degradation of drug actives and destabilize emulsions, Croda has tested for improved oxidative stability using various test methods on both our polar and non-polar pharmaceutical excipients. In addition, Super Refined excipients have demonstrated lower taste impact, which can lead to improved taste profiles of oral formulations. This can be especially ideal for infant and child Rx and OTC drug products. Other benefits of Super Refined excipients include the reduction of cellular irritation, which can minimize issues at the site of application or injection of the drug. We run a continuous testing program for our excipient range to demonstrate various benefits to the drug formulator and can provide our customers more information on the various benefits Croda excipients can provide. Q: In what dosage forms can Super Refined excipients be used? A: One of Croda’s focus areas is to innovate within the compendia. By doing so, we target excipients that are commonly used for various dosage forms that include topical, parenteral, oral, ophthalmic, nasal, ocular, and transdermal dosage routes, just to name a few. We also work closely with our customers to help them address their specific purity issues using our proprietary process.